How do neurons work? Neuroengineering uses engineering techniques to understand, repair, replace, enhance, or otherwise exploit the properties of neural systems. The engineers use the engineering principles to develop quantitative tools and methods for the neuroscience research. Scientists use these neurotechnologies for understanding the complex neural computation and behavior via recording and processing neural activities, as well as improve and repair brain function through stimulating the neurons. My research interests attend to the development of the bio-micro-electro-mechanical systems (BioMEMS) sensor, the neural information processing system, the neural imaging and the neural coding and decoding for understanding and modeling the complex neural systems. To better understand the neuron network in the brain, I have developed a flexible and MR-compatible multichannel neural probe that can be used to both neural recording and stimulation for long-term study. In addition, I developed the automatic spike sorting algorithm and hardware for the online neural signal processing. After the neural signal capture devices and a spike sorting method were produced, I am going to use these tools for investigating the neurovascular responses of deep brain stimulation (DBS) and for modeling the tactile motion perception in the non-human primate's somatosensory cortex. For further study the brain connectivity, I have developed a novel non-invasive, reversible and localized brain modulation method, focused ultrasound (FUS), which is suitable for a variety of neurophysiological experiments and clinical applications. In summary, I sought to develop novel neurotechnologies for understanding neural coding and translational research. Dr. Hsin-Yi Lai focuses on developing and applying cutting-edge neuroengineering approaches to investigate brain function and treat neurological diseases. She received her Ph.D. degrees in Electrical Control Engineering from the National Chiao Tung University, Hsinchu, Taiwan, in 2011. Using Bio-Micro-Electro-Mechanical Systems (BioMEMS) and nano¬materials, she have developed a multichannel electrode array for chronic recording and stimulation and further developed novel nanocarriers with anti-inflammatory drug for improving the biocompatibility. In 2012-2013, she was a postdoctoral research fellow of the Department of Neurology, University of North Carolina, Chapel Hill, USA, where she served as the head of Deep Brain Stimulation (DBS) imaging research group and the manager of 9.4T MRI laboratory. She developed a novel means for electrophysiological recording inside the MRI using multichannel flexible electrode array and applied simultaneous DBS-fMRI to explore the functional connectivity enhanced by deep brain stimulation. 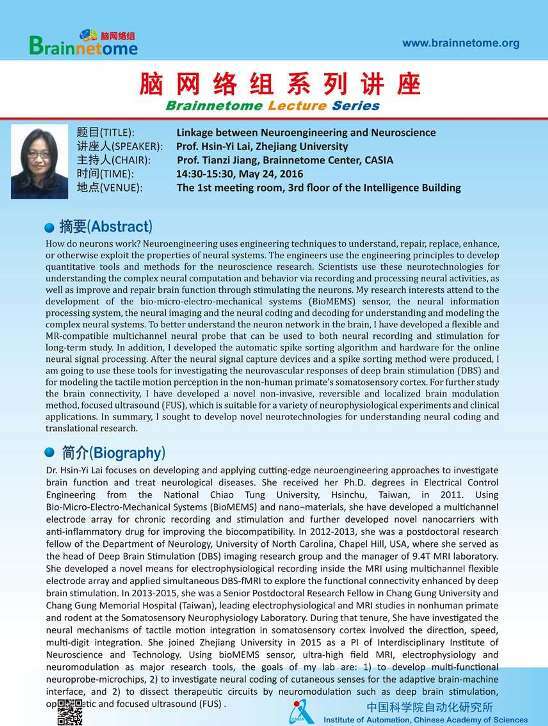 In 2013-2015, she was a Senior Postdoctoral Research Fellow in Chang Gung University and Chang Gung Memorial Hospital (Taiwan), leading electrophysiological and MRI studies in nonhuman primate and rodent at the Somatosensory Neurophysiology Laboratory. During that tenure, She have investigated the neural mechanisms of tactile motion integration in somatosensory cortex involved the direction, speed, multi-digit integration. She joined Zhejiang University in 2015 as a PI of Interdisciplinary Institute of Neuroscience and Technology. Using bioMEMS sensor, ultra-high field MRI, electrophysiology and neuromodulation as major research tools, the goals of my lab are: 1) to develop multi-functional neuroprobe-microchips, 2) to investigate neural coding of cutaneous senses for the adaptive brain-machine interface, and 2) to dissect therapeutic circuits by neuromodulation such as deep brain stimulation, optogenetic and focused ultrasound (FUS).